I attended a gathering earlier this week and was asked to bring a dessert for 10 people. I have been waiting for an excuse to buy a mini cheesecake pan and I thought this would be the perfect opportunity. I obsessed over which recipe to make, there are so many great ideas about making these adorable cheesecakes. I ended up making one with a little lemon zest and a graham cracker crust, and the other a vanilla bean with chocolate cookie crust. They were both delicious and I don't need to eat any more cheesecake for a while! My goodness, where has the time gone. I didn't mean to be away from here for so long. I have reorganized my sewing space and begun work on a new quilt. More posts this weekend. Happy Valentines Day! 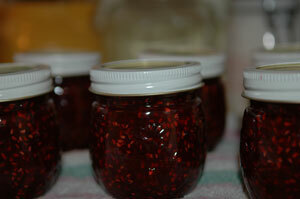 This morning I made Raspberry Jam with my two sisters and my Mom. 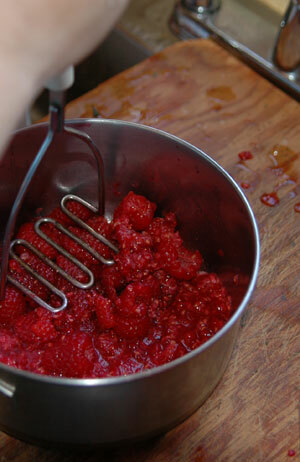 Growing up, we had a ton of raspberry bushes in our backyard and all summer we would pick and my Mom would make jam. The raspberry bushes at my Mom's place are gone now and these days a small basket costs a lot! Safeway has been running a special for the last few days of raspberry baskets for $1. each! What! How can that be right?? 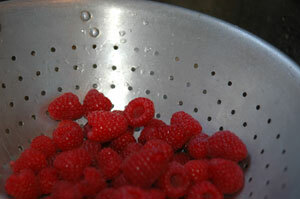 And, to make the deal even sweeter, they are big, ripe, bursting with flavor, sweet raspberries. While making these we were talking about how great it will be to have these in the cupboard and be able to give them away to friends as gifts. But when we each went home with just four jars I thought I can't part with any of them. Call me selfish but I NEED all of these to get me through the year. If I space them just right they could last for a while!